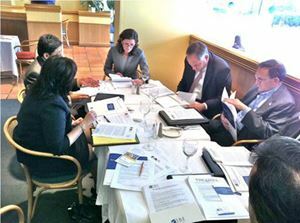 IBAW's Sales Roundtable takes place every month featuring timely topics and workshops on Sales, Marketing and Branding. This is a free event open only to IBAW members. 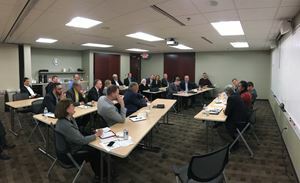 IBAW'S Public Policy Committee hosts a Legislative Roundtable for our members with elected officials from Madison. Topics covered were workforce training, business regulations and budget concerns. IBAW members get a demonstration of underwater robotics at LakeView Technical Academy in Kenosha. This event is another one of IBAW's Business Behind the Scenes events. A IBAW member tries out the refueling simulator at the 129th Air Refueling during IBAW's Jets...with ED event. Christine McMahon facilitates "Innovation Because Growth Matters" learning session to IBAW members. Lt. Gov. Kleefisch at the "We Built It Rally." Craig Culver and his team at an IBAW breakfast. A full house makes for quality networking. 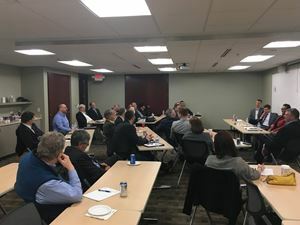 Roundtable Tax & Business discussion in Madison with Lt. Gov. Kleefiesch. 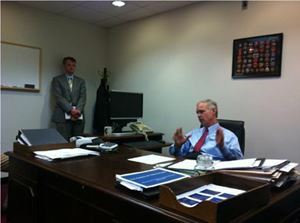 The IBAW gets an inside perspective on Wisconsin's energy situation from Chief Economist John Felmy of the American Petroleum Institute, Washington D.C.
Meeting with Senator Ron Johnson at his office in Washington D.C.